New York State Big Year? I first met Anthony Collerton when he was trying to see the Barrow’s Goldeneye at Jamaica Bay back in February. It was something like his fifth attempt at the bird. That made me wonder why someone would put so much energy into a species that is regular in New York and not a lifer. As of Friday, 11 May, Anthony had already seen 283 species in New York State, a blistering and likely record-setting pace (Richard Fried is the current record-holder with 352 species seen in 2011). 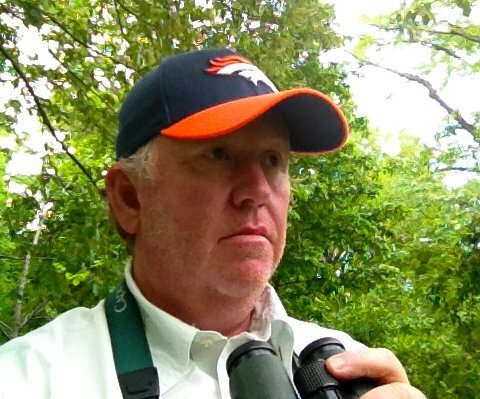 Birders are confused – is Anthony doing a big year or is he just a birding machine? So, Anthony, the New York State birding community is dying to know – are you doing a big year? You know, people started asking me that back in January, when my list popped up on eBird, and have been asking ever since. The honest answer is a very definite…maybe. But I appreciate the chance to explain – I’m not trying to mess with anyone’s head, honestly. Truth is, coming in to this year I found myself with some time off after the sale of a business, but I was tied to New York and not really able to travel extensively for family reasons. I started birding locally because I had the time, and started keeping the year list to keep things interesting in the absence of any possible life birds. Year listing is a wonderful thing that tricks your brain into getting excited about chasing Ring-necked Pheasant in a park in Queens, or prowling the suburbs of Staten Island looking for White-winged Dove. If I weren’t tied to the city, I’d probably have gone back to World Listing this year (a passion that took me around the world for 20+ years), but not having that option, getting 150 species in New York in January became a goal to motivate me to get out more and to keep things interesting. Why are you doing a big year? I think I touched on that but I can say that there are some really good reasons to do some extensive year listing, beyond just the motivation factor of keeping a list. I’ve done very little NYS birding for many years, so it’s been a great way to reintroduce myself to the birds and birders of New York State. I’m seeing some great species, have been to some neat places and have met some interesting people (the good interesting). Good reasons to stay local regardless of records and the like. What strategies are you using? Lots of pelagics? How many times do you think you will do the Adirondacks? Niagara? I’ve been upstate six times so far this year and imagine I’d go at least another ten times before the end of the year if I kept at it – two trips planned for May/June already. It really depends on where the strays and vagrants show up in the second half of the year. From talking to people who’ve done this, it seems that a New York big year has a couple of different phases. For the first part of the year, and through the spring migration, you can just get out there and go birding every day. If you do that, and spend some time looking for boreal birds in the Adirondacks, gulls at Niagara, etc. then eventually you’re going to see most of the residents, spring migrants, wintering species and regular breeders. That’s about 300 species in a typical year. After that, it gets tough. Spend enough time looking for shorebirds in summer/fall and you can add another fifteen species, and if you go offshore on four or five pelagic trips and spend some time birding the beaches in summer, you could add another fifteen species of seabird and tern (maybe more with another hurricane). But even after all that, you’d still be nearly 25 species shy of the record, and the difference has to come from chasing strays and vagrants when and where they show up. Do you plan to make runs at Spruce Grouse and Gray Partridge? Yes, I’m planning to spend at least a few days looking for Spruce Grouse. It’s a special bird and while I’ve seen them in Minnesota and Vermont, I’d love to see one in New York. Gray Partridge, on the other hand, is a long shot. There haven’t been many records recently and the lack of snow cover last winter made it tough to go and look for them. I have my ears to the ground though so I’d probably go and look next winter if I get some credible information. It’s a species I grew up with in Wales and I’ve seen them more recently in Ontario; I would love to pin some down in New York, if for no other reason than knowing that they’re still hanging on out there. What has been the most surprising bird of the year so far? I don’t think anyone was really expecting a Grace’s Warbler in January, as a first state record it has to be the surprise of the year so far. 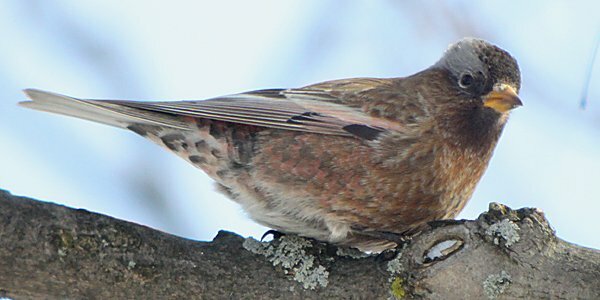 The Gray-crowned Rosy-Finch was also really special, although perhaps more expected given that they showed up this winter in Ontario and other places in the east. Hoping for a few more surprises this fall. What are the most inexplicable gaps in your checklist at this moment? Lapland Longspur and Northern Goshawk – yes, I’m hanging my head in shame as I write these words. Neither should be tough given the amount of time I’ve spent in the field but I’ve managed to avoid both species pretty effectively so far this year. How has doing a big year affected your personal life? I know that some people think I’m out birding 24-7 but I’m really not. I’m basically treating my birding schedule a bit like a job, 7am to 7pm, five days a week, with the occasional early start, weekend meeting, or business trip. It really isn’t anywhere near as disruptive as any of the “real” jobs I’ve done over the years. I haven’t had to go on a single short-notice business trip to Mumbai so far this year for example. What is your favorite place in New York to bird? If I were forced to pick one place it would be the east end of Long Island, and the woods, marshes and ocean around our home in Northwest Harbor. I love that area and the diversity of avian and marine life that comes through during the year. Having said that, one of the best parts of this year has been going to new places and seeing things that I don’t usually see out east. I really enjoyed my trip to Niagara, my two trips to the Braddock Bay area, and of course the trips to the Adirondacks. I’m really looking forward to getting up to St. Lawrence county later this year and I’m sure I’ll discover some new spots that I’ll want to go back to again and again. How has the birding community reacted to your record-setting pace? I think the birding community has been incredibly supportive and many lined up to help with my big year long before I personally had any inkling that I might be doing one. Richard Fried in particular has been incredibly gracious and generous of his time, information, and advice. I’d also have to give a big thank you to Joan Collins and Greg Lawrence who have taught me so much about the Adirondacks and the ‘Niagara Frontier’ this year. What bird would you most like to see in New York this year? Now that’s a tough question, and I suspect the answer would change as I think about different things throughout the year. Right now I’m thinking I’d love to see (or just hear) Yellow Rail, or perhaps Black Rail. Both are quite possible I suppose so perhaps I should root for an addition to the NYS list and ask for a pteradroma (Bermuda Petrel populations are rising I hear) or maybe a Yellow-nosed Albatross. Hey, you don’t ask, you don’t get …. What advice do you have for future New York big year birders? I think the obvious advice is to plan ahead. Like Richard Fried last year, I didn’t start to think systematically about building a list until several months into the year. If I could have the first quarter back again, there would be quite a few things that I would have done differently and I would have more species now (Dovekie!). The other obvious piece of advice is to go for every vagrant or stray as soon as you hear about it. You’ll miss some, but you’ll get some and it’s the strays that make the difference between 330 and 350 or 360. Just to thank all the folks who’ve been so helpful so far this year. I’ve spent time with some very talented birders, and made some great new friends so far this year. Looking forward to what the second half brings. Thanks for your time, Anthony, and good luck!